Siding nailers are one of the best tools to have on hand. When you don’t have one, you don’t know how handy it is to have one in your toolkit. A siding nailer is used for… doing siding. Shocking, I know. It’s specifically useful for affixing thinner materials to thick pieces of wood, which is its primary role. Comparing it to a framing nailer, which is intended for building large wooden structures and doing things like housing frames and fences, a siding nailer is made for more specific purposes. A siding nail gun is no replacement for a brad/finish nailer, which is used specifically for dealing with delicate materials, attaching them together without breaking them. While these nailers that deal with a smaller gauge nail are used for smaller carpentry jobs or indoor jobs, the siding nailer is handier for bigger jobs. It’s important to know what kind of nailer you need for the job at hand, and you determine that by figuring out what the job requires you to use. If you need a smaller nail gauge or you’re working with very thin materials, you may want to go with a brad nailer or a finish nailer. If you’re building a structure, use that framing nailer. If you need the thinnest nails you can get, you’ll want a pin nailer. You use a siding nailer when you need a more delicate touch than a framing nailer can provide, but a bigger nail than what a finish nailer can fire out. It’s essentially designed to fill that in-between role. There are four types of nailers – pneumatic, electric, gas nailers, and powder-actuated nail guns. Pneumatic is a fancy way of saying it is air powered. So there’s no battery to deal with, no charger, no “I sure hope this silly thing doesn’t lose its charge before I finish this side of the house because that would be irritating”, nothing like that. You hook up a hose to an air compressor that is compatible with the nailer (very important! ), and you use the air power to fire the nails into the materials you’re working with. 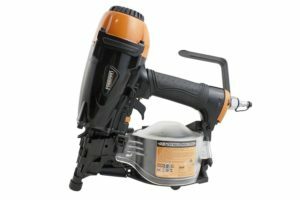 A battery operated nailer just uses a battery. It saves you money on getting a good air compressor, but in return, you have to deal with the issues associated with batteries. Some batteries have a pretty solid lifespan though, and if you get two, then it’s not so bad. Gas nailers require both battery and fuel cell to operate. Its mechanism of action is somewhat similar to that of an internal combustion engine. A fuel cell contains a flammable gas, which fills up the combustion chamber. Then, a spark plug ignites the gas which creates a small explosion within the chamber and drives the nail. Such kind of nail guns are cordless, powerful, and the battery in gas nailers usually lasts for up to five thousands of nails, since the battery isn’t the main energy source here but just needed for the spark plug to operate. But you will have to spend extra on fuel cells which lasts for like ~1000 nails each. Moreover, gas nail guns are less effective in cold conditions. Powder actuated nail guns are the least popular and the most powerful ones. They use blank cartridges as their energy source and can drive the nails through materials like concrete and steel. User-friendliness is one of the most valuable things you can find in a nailer. Why wouldn’t you want something that is easy to use and understand? So keep that in mind when you go out and buy one. A lot of the things we point out assist with user-friendliness. Things that help with that include having a large magazine capacity. A good magazine capacity keeps your nailer going for as long as you need it to. Other things to look for include good, non-marking tips. You don’t want the nailer’s tip to scratch up the work surface. The nail gun should be compact and lightweight. Magnesium alloys is a good material for use within the nailer, as it is light and strong. The lighter the nailer the easier it is to handle. It won’t weigh you down or tire you out easily, and the small stature will make it easy to maneuver around tighter areas. This isn’t as vital with a siding nailer as it would be for a framing or pin nailer, for example, but it’s still convenient to have a compact unit. The quality of construction matters a good deal. Pay attention to the warranty, because that tells you the expected minimum lifespan of the nailer. In other words, a 3-year warranty tells you that the nail gun should at the very least survive continuous usage for over 3 years. You don’t want to have to be constantly replacing your nailer. Get one that’s going to last. A wise consumer pays attention to what comes with the nailer. I have been known to be adamant about eye safety, and I shall continue the trend by mentioning that many nailers come with safety goggles or glasses that you absolutely should use. Many also come with protector cases, keeping dust away from the nailer while it’s put away and allowing you to transport it without dinging it up. And when you’re on the job, a nice belt hook is a great way to keep it close to your side. We’ve picked out 5 of the best siding nailers on Amazon for your consideration. These ones hit all those key areas we mentioned above – they’re not too heavy, they have good capacity, and they are quality tools. 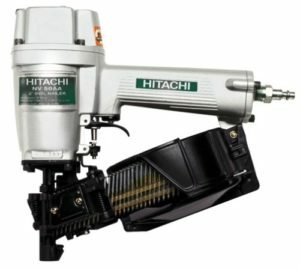 As far as nailers go, Hitachi is known for churning out some of the best ones on the market. They are a reliable, well-respected brand who have a big name to live up to, which is why they keep producing good products. Their siding nailing is a particularly good one. One con which we will point out right from the start is that it’s expensive. Hitachi NV50AA costs quite a bit. This nail gun is professional quality, after all, and it’s built to survive the punishment a professional carpenter would put it through. It is well worth the money, naturally, but bear in mind that it is quite an investment. This pneumatic nailer has a capacity of 385, making it useful for longer projects that eat up lots of nails. You’ll be able to fire for a long time, plus you can check up on the remaining nails easily because of the open magazine canister. This is good because while dry firing is bad for the unit, mechanisms that stop you from firing once you hit a certain threshold can also be wasteful. This is the best of both worlds. As long as you are diligent, you won’t dry fire. This nail gun comes with a nice 5-year warranty, and we know what that means. The manufacturer has high hopes for the longevity of the nailer. Controls are easy to use and understand. There is a lot of freedom in the settings of the unit. You can keep it simple, or fine-tune it to fire in at the exact depth-of-drive you want. This nailer is only 4.2 pounds, making it one of the lightest ones on this list. The lightness makes it great for long jobs that will require you to keep it firing for long stretches of time. It’s easy to handle, and on top of the low weight, the grip is comfortable. The nailer comes with a pair of safety goggles, as well as a set of hex-keys. This is another nail gun that is built to last forever. 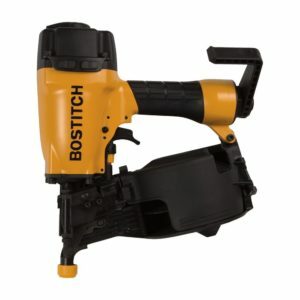 Bostitch, in general, builds so many good power tools, just like this one. The reliability of it is nearly unparalleled. It’s going to keep working for as long as you need it to, through countless jobs across many years. The soft, rubber tip prevents you from accidentally damaging the work area, which is something we really like because let’s face it – it would be very frustrating to finish nailing in something only for you to end up scratching it up. Simplicity is a core design trait of a lot of Bostitch nail guns. Bostitch N66C-1 continues the tradition with its simple adjustable depth guide so you can hit the depths you want/need to without having to fiddle with it too much. 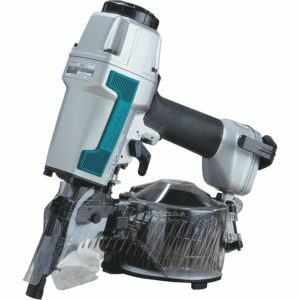 The base material for this nailer is aluminium, a common choice for power tools like these because it’s lightweight but can handle a lot of abuse. We mentioned the durability before, and this is the secret to its durability. One really cool feature that we haven’t seen too often is the tool-free adjustable exhaust. You can aim it however you need to, keeping it away from both the work area and your face. A clever addition to the nailer like this isn’t something to overlook. The operating pressure is between 70-120 psi. Versatility is one of the key ingredients to this nailer – Bostitch N66C-1 can get through soft woods without destroying them, but it also has the penetrating power to get through steel. That’s a handy capability to have for a siding nailer, as you will often be working with all kinds of materials, especially if you get into it professionally. We’re very fond of the 350 nail magazine that is easy to load. On top of the high capacity, it’s also really easy to clear jams, if they should occur. The N66C-1 comes with a handy carrying case, but nothing else, so make sure you get some eye protection. Safety first. 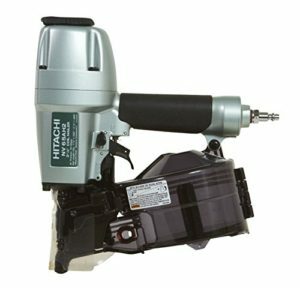 The NV65AH2 is the second Hitachi nailer on this list and the number three overall in our ranking. This is a sleek unit that encompasses everything we mean when we say “user-friendly”. Everything about this nail gun is easy to understand. It takes you seconds to figure it all out. It’s lightweight at only 4.8 pounds, and it’s small and compact. The magazine has a good capacity and it’s got a simple, easy-to-load design that makes it easy to keep it topped up. This nail gun has contact fire for safety, which means that in order to fire the nailer, you must pull the trigger and press it to the work surface for a nail to fire. This is pretty standard, but it’s also an important safety mechanism which prevents you from accidentally embedding a nail into your hand, the wrong wall, or someone else in the room. Adjusting the depth-of-drive is easy, it requires no additional tools – just a quick adjustment on the nail gun itself, giving you the same control as any other nailer but being much simpler to adjust in the first place. The 360-degree exhaust can be pointed where you want it to be, to keep all the unpleasant stuff away from your face and the work area. We’ve mentioned before that having a non-marking tip is important, and this nailer features one, protecting the surface from getting scratched up. This nail gun is perfect for jobs that require a quick touch – it fires off three nails per second and has an operating pressure of 70-120 psi. This one also comes with several accessories, including my personal favourite – safety glasses. It also comes with several hex bar wrenches. This awesome-looking nail gun has a number of great features that we’re fond of. It’s got the standard select fire system that most nailers have, letting you choose between sequential fire and bump fire mode. One special thing to note with Makita AN611 is that it features a badass-looking drum magazine. It’s easy to load and unload, it’s got a capacity of 400 nails, and it has automatic nail adjustment. It’s not difficult to clear jams from the unit when they do occur, and they won’t happen often with this nailer. The drum design makes the nail gun look a little wider but shorter. The rubber tip prevents scratching and damage to the work surface, and the grip is comfortable and doesn’t slide around in your hands, so you don’t have to gorilla grip the nailer all day long. This nail gun comes with simple, tool-free, depth-of-drive adjustment settings that you can switch between with just a simple knob. There is a wide selection of choices too so despite being user-friendly, it also retains the versatility of other nailers. Makita’s AN611 features an air filter to prevent dust and other things from damaging the internal workings of the machine. It also comes with some hex wrenches and oil for maintenance, and a sweet protector case for keeping it safe during transportation. And this nailer also comes with a pair of safety goggles to keep nails and debris out of your soft eyes. If you’re looking for precision and power wrapped up in one, you’ll want to consider this power-house of a nailer from Freeman. This thing can penetrate cement and concrete like it’s nothing. The design also enables precise placement so you can drive the nail into the perfect spot every single time, whether you’re using bump fire to place them quickly or you’re slowly, methodically driving in each nail individually. This is a versatile nailer that is compact and not too heavy, made to go through all kinds of different materials for all of your siding needs. Freeman PCN65 features the 360-degree exhaust that we appreciate, and an air filter – combined, they protect both the nailer and the user from any harmful toxins, dust, and debris. The body is magnesium with aluminium parts. We mentioned before that these materials are great for keeping a nailer both lightweight and strong, and this is a great example of that. Not only will it last a long time (and the 7-year warranty confirms that it probably will), it is very light, the lightest nailer on this lift. It feels like a feather in your hand. It’s got easy to use depth of drive settings and an open nose to let you clear jams in a second if they arise. This nailer comes with a belt hook, which is always great to have since it keeps the nailer in reach at all times, even if you’re up on a ladder. A big scary thing you might be seeing all over the place on Amazon when shopping for power tools is the Proposition 65 warning. This may dissuade you from purchasing tools that carry the warning. I will not tell you whether you should ignore it or heed it, I will simply explain what it is and what it means. California passed Proposition 65 which states that all products that have compounds that could potentially cause cancer, birth defects, or reproductive harm must come with a warning label. When you see that warning on a power tool, all it means is that the manufacturer is complying with proposition 65 and posting a warning label on their products. Some nail guns will have them, some will not. Remember, a prop 65 warning only means the product may contain these harmful compounds. It does not necessarily mean that you must avoid purchasing these products. There are safety measures you can take, such as wearing a face mask and safety goggles and gloves, that will reduce the risks dramatically. If you are concerned about prop 65 warning labels, then you should do additional research to make sure that you know what you are dealing with. Siding nailers are a sort of “in-between” tool. When you go out shopping for a nailer, the first ones you get are generally framing nailers, finish nailers, or pin nailers, depending on your needs. So this isn’t the first tool you’ll get in your arsenal. That doesn’t mean that siding nailers are less important, however. When you are dealing with siding, or really any kind of carpentry job that requires that you join work materials to a wood frame, siding nailers are very effective. They are delicate enough to handle thinner materials without destroying them – a problem that other nailers might run into. Despite this, they can still penetrate anything you need to get through. One of these nailers is strong enough to even get through concrete. Some nail guns can be a bit obtuse to control, which is why we stress finding a siding nailer that has a user-friendly depth adjustment mechanism. You want full control over your nailer’s depth of drive, but you don’t want something that is needlessly complicated. Power tools are made specifically to be as complex as possible. The versatility of a siding nailer is often underwritten, but there are a lot of jobs they can handle. Once you get your hands on one, you won’t know what you did without it. If you have concerns about the proposition 65 warnings that come with some nail guns – and you should, it’s important to know if there are potential health risks with a product you’ll be using – then do your research and figure out if you want to avoid nailers that trigger those warnings or not. There are other safety precautions you can take when using products that have a prop 65 warning, so keep that in mind as well. Something as simple as wearing protective gear can eliminate those risks.